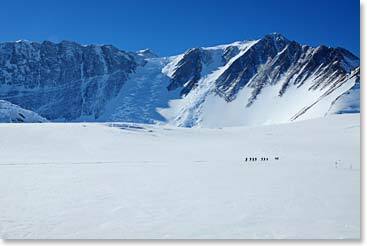 It is Saturday, December 1st, still at High Camp, still relatively good conditions, although on the ridges all around us it is very evident that this bad weather, that we have been getting the forecast for, is imminent. Mark, the meteorologist at Union Glacier has now predicted that we are going to have those really high winds they've been talking about are talking about 50 knots wind here at high camp, all day on Sunday and Monday, very likely. So what we’ve done, not just Vaughan, Todd and I but all the climbing groups here at high camp, is that we decided to descend the fixed line today to Low Camp. It is not that the weather is going to be that great in Low Camp; it is just that we will be at lower elevation, have much better options for lower winds and taking care of ourselves to wait these things out. Don’t worry, Mount Vinson is still in our future. It is just that looking to sitting out storms at this elevation, a big storm at this elevation, Sunday and Monday, probably Monday as well, doesn’t seem to be the smart things to do. So we are going to be sitting at Low Camp and living there and continuing to report. Our team is doing great, the other teams are doing well and we are glad to have this window for the worse weather to come in at Ellsworth Mountain to get down to a bit lower elevation. On and out, I will keep you updated. But today, Saturday’s report is down the fix lines to Low Camp. It is about 4pm on December 1st, I thought I would let you know that we arrived back at Low Camp. 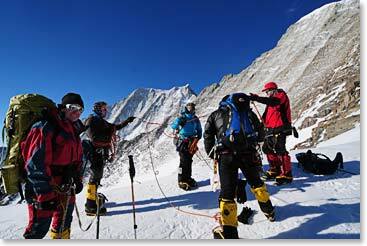 All of the teams have now descended to Low Camp; no one is high on the mountain. Seems like we have been gone long time, it is pretty nice down here. Of course we had to get our tents out, from the duffel bags that we stored them in, we worked our platform a little bit and we are beginning to set up right now. The weather is quite good right now; we are here to be prepared for this big storm that we are anticipating over the weekend and into early next week, even Monday and who knows about Tuesday. We will be ready. Vaughan made good going down on the steep fixed line today, he likes the technical part of this climb. 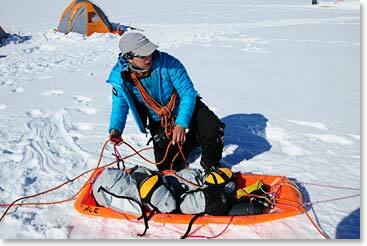 We passed 12 anchors, snow anchors, set into the glacier ice, with the 3 of us roped together. On each anchor, we had to unclip, clip around the anchor, put your weight back on the fixed line, leaned downhill and walked and of course we had our packs on. We descended pretty quickly. So here we are, feeling secure, still at pretty good elevation to stay acclimatized. 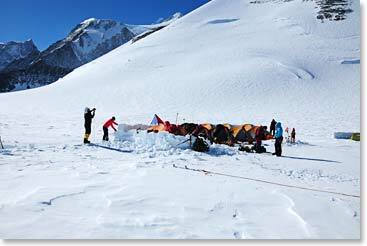 Good acclimatization the days at high camp but we are safe and secure if the storm comes in. We will keep you posted on how we are doing day to day as we hang on here at Low Camp and wait for the conditions to climb to the summit mount Vinson to get better.